Beyonce is one of those artists that you can’t stop talking about…what is she wearing, when she is coming out with music, how does she always look so luminous…are just a few things we can talk about with Beyonce and for me its how does she smell? Â My guess was sweet…like her personality! I was justÂ lookingÂ for a summerÂ fragrance and IÂ found it in Â Beyonce’s Heat Rush. You would think that with a name like Heat Rush that the fragrance would be like bam Â in your face, butÂ itsÂ soooo not– its a soft, sweetÂ Â almost powdery scent and I can smell hints of orange. Like almost every other fragrance when you first spray the fragrance there is aÂ blast of scent, but then it settles and its beautiful. The Heat Rush fragrance comes in a sexyÂ orangeÂ bottle…which is unexpected, but its bright and bold. Was Amber Rose Hacked Again, Tweet Dissing Kanye? Jersey Shore: DJ Pauly D Made $11 Million This Year! 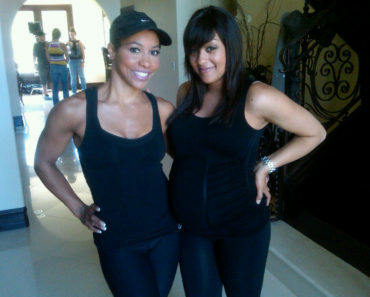 Tia Mowry Still Doing Yoga at 9 Months Pregnant!